Some days it’s difficult to believe that nothing special happens. Actually, I’m sure special things happened today, they just didn’t occur in this house. It was an ordinary, hum-drum, do-the-laundry-and-take-out-the-trash kind of day. Literally. Add in making dinner – and baking some biscuits too – since I had time. After last Friday’s writing prompt on the word “ordinary,” I’ve been thinking a lot about that very thing. I’ve been thinking how much an ordinary, common, everyday life can weigh a person down. How it can slowly etch away at a vibrant personality and transform that person into someone very different. Many people know about this if they’ve been married a while or if they have been living in the trenches with babies on their hips and toddlers running underfoot. You may have started to wither under the weight of it all. I know, because I’ve seen it happen to myself. Ordinary can also transform a person into something better. It’s a matter of perspective I would say…and how often you step back and see how far God has brought you in your spiritual growth. Our everyday life can be so repetitive that it may be hard to see “the forest through the trees.” Growth happens. Renewal happens. Winter happens, then Spring happens. I’ve had one of those weeks that was very tiring. I also caught a cold which could be the reason that I’ve been dragging along all week. But, it doesn’t mean that something didn’t happen for me spiritually. I’ve been forced to slow down. I have had a few things taken off my responsibility list and so I’ve experienced thankfulness. And just when I didn’t think I could handle another broken heat pump part, it turned out to be some disconnected wires and a FREE service call! And, when the fencing people called and said “I know it’s short notice, but…” I was very happy that today they would install my pool fence. Short notice? I’m thankful that it’s finally going to get put in.. 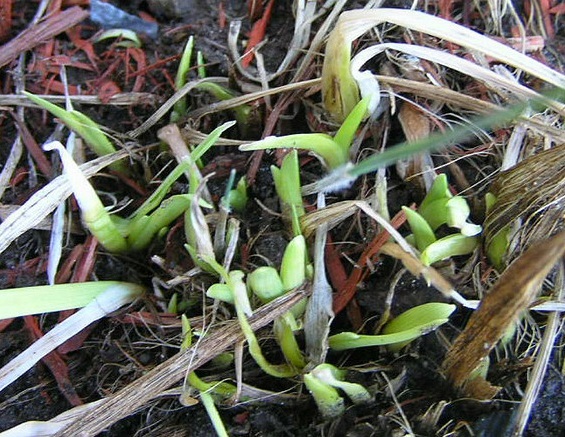 I see sprouts of my day lilies shooting up in my flower beds regardless of the cold, frigid nights. Winter is still happening, but Spring is about to start. Clouds will roll back and before you know it, the sun will be blistering hot. And I will be truly thankful for some better weather and some evidence of the Earth’s renewal. It will still be an ordinary and common life, but change and growth happen quite frequently in these days and nights that seem to all run together. And there’s always more that God can give you, just around the corner from today. God’s still in control, He’s still on the throne. And today, I am thankful for that truth. May it reside in your heart and soul today like a bright and sunny day.